Although I thought the Good Night Vermont was only mediocre, both Arya and I enjoyed reading Good Night New York City by Adam Gamble and Joe Veno. Like all books in the Good Night Tour World series, Good Night New York City focuses on major attractions throughout New York City within the thin context of a children’s book. My five-month old baby liked the colorful images and I thought the book was interesting enough to read to her more than once. Each page of Good Night New York City highlights one attraction in the city including: Statue of Liberty, Staten Island Ferry, United Nations, NYC Police and Firefighters, Empire State Building, Central Park, Bronx Zoo, Coney Island, NYC Public Library, Hot Dog Stand, American Museum of Natural History, Brooklyn Bridge, Broadway, Rockefeller Center, and Times Square. Cute, colorful pictures by Joe Veno illustrate each attraction. Extra details, like the small American flag on Liberty Island or the red apple hot air balloon by the Empire State Building add unique touches to each page. Text consists of simple sentences identifying the location and an occasional descriptive phrase above the venue. Children who are old enough to read will be bored by the plain text. Adult readers will not be impressed by the lack of plot or message. I really liked two specific aspects of the book. On the Public Library page, the little girl is carrying five books in the Good Night series. While a form of not-so-subtle marketing, the books comes across as a cute touch. On the Art Museum page, two famous pictures are placed next to a less-famous picture. Washington Crossing the Delaware and The Starry Night will be familiar to most readers. Next to those pictures is “NYC Hot Dog Stand” by Joe Veno. The picture is the same hot dog stand picture as found earlier in Good Night New York City. Arya enjoyed many of the larger, colorful pictures. She particularly liked the Broadway show and the picture of Times Square. The entire book took only a few minutes to read and she wanted to spend much more time on each page than it took me to read the short text. 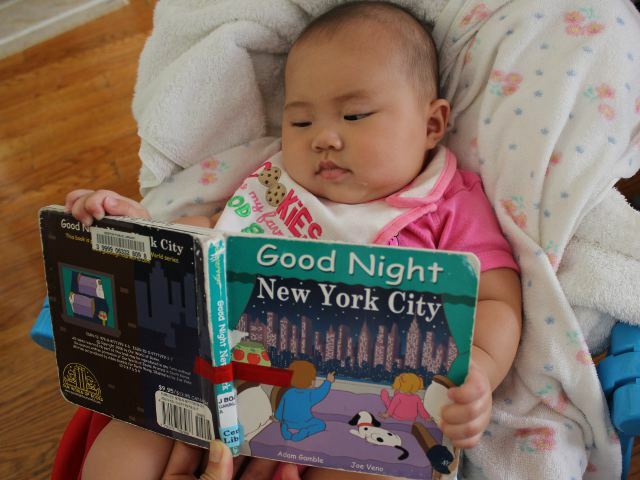 Good Night New York City would be a great book for children living in or visiting New York City. The pictures are sufficient for children to be able to identify the tourist attractions while learning names will be a fun exercise for school-age kids. Good Night New York City costs (including shipping) less than $10 new and $6 used from Amazon.